Record breaking athlete, Steve Cram, has today unveiled plans for an exciting new event to be added to Kielder Marathon weekend. This year, the sporting extravaganza at Kielder Water & Forest Park, Northumberland, will include a half marathon, as well as the usual favourites – the Kielder 10K, Run-Bike-Run, junior races and the main marathon itself. Held alongside ‘Britain’s most beautiful marathon’ on Sunday October 4, 2015, the Half Marathon will start at Kielder Dam and finish at Northumbrian Water’s Leaplish Waterside Park. 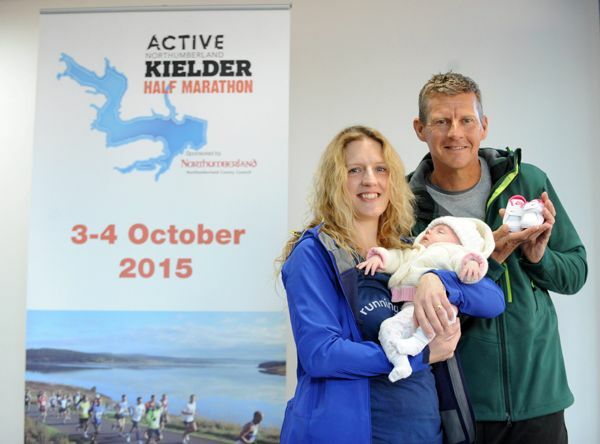 Event Director, Steve Cram, said: "This year is very exciting for us with a new addition to Kielder Marathon weekend. "Kielder is a beautiful running and cycling destination but the marathon and 10K are at opposite ends of the spectrum. "The half marathon is a very popular distance and we’re delighted that we can now offer it here, in an unmissable location, and together with Active Northumberland secure the future of this hugely popular event." The North-East’s newest long distance race already has the backing of national television newsreader, Sophie Raworth, who has signed up to compete in the 13.1 mile challenge. She said: "The great thing about Kielder Half Marathon for me is it’s a trail run and this will be the first one I’ve ever done - all the half marathons I normally do are on the road. "It will be really nice to run a half marathon, which I find far more manageable than a marathon, in such a beautiful part of the world." This year she's aiming to double the distance and run the Half Marathon, and hopes her five week old daughter, Charlotte, will eventually follow in her footsteps. Louise said: "I’ve run a dozen 10Ks in the area but Kielder is my favourite – it’s well organised and it’s such a lovely route. Last year I was only 20 minutes slower than my best time, and that was when I was pregnant. "Hopefully Charlotte will enjoy being active and outdoors too, I can’t wait for her to grow into her first pair of trainers!" Kielder Marathon, which is now in its sixth year and welcomes more than 3,000 runners annually, is returning with title sponsors, Active Northumberland for 2015. Councillor Val Tyler, policy board member for community infrastructure and culture at Northumberland County Council, said: "I’m very proud that Northumberland County Council is supporting Active Northumberland to sponsor the event as I can’t think of a more beautiful or inspiring place than Kielder to hold a marathon. "I’m delighted that it has quickly become such a popular date on the calendar with athletes of all levels from across the country turning up to take part and with the addition of the Half Marathon this year there’s now even more on offer. "Last year many athletes brought their families with them to enjoy our beautiful county and I hope that they will return again this year to explore it further." The marathon has become a firm favourite in the racing calendar thanks to its spectacular setting and unique course. At approximately 26 miles long it is the ideal venue for the ultimate running challenge. Entries for all events are now open and being accepted at www.kieldermarathon.com. For enquiries telephone 01434 689 040 (Monday to Friday, 9am – 5pm).